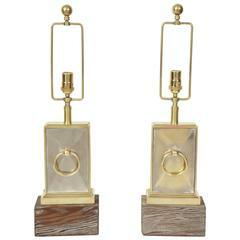 Wonderful pair of 1950s wooden lamps by James Mont. The lamps have a black lacquered finish and they have been newly rewired with antique brass double clusters. The height just to the top of the wooden lamp body is 13.5". Pair of hand-carved table lamps with Chinese figures decorated in gold leaf and white gold leaf by James Mont, American, 1950s. New custom silk shades by Lobel Modern. Midcentury table lamps in the manner of James Mont made of decorative brass on black round plinths topped with new custom black drum shades with gold interior. Pair of impressive scale silver leaf lamps with inset mirror panels in the manner of James Mont. Rewired for use in the USA with silver silk cords and satin nickel sockets. James Mont ceramic lamp with original Maria Kipp split wood lamp shade with interwoven colored fibers of green and cream.